A couple of months ago, my boyfriend challenged me to a mystery box cook-off. After watching one too many episodes of the Food Network show "Chopped" I was up for the challenge! This month's ingredients were beer, ham and rosemary. I made Rosemary-Garlic-Beer Focaccia with Smoked Gouda and Ham, however I was definitely outdone by our two winners this month (they were both so great I couldn't break the tie)! Both of these winners should email me their addresses so I can send out the Starbucks gift cards! Check out the Navy Bean Soup with Guinness Cheddar Biscuits over at Health Delicious! And Zara over at Crazy Mom made a kid friendly Cheesy Potato Casserole with Greens! This month I let debaters have reign and pick the ingredients. At 8:30 on a Thursday morning, they decided the theme would be "Things that start with 'ch'" for the ingredient list. So here they are! Since I introduced the March challenge a bit later in the month, a number of bloggers told me they would have to wait until April. So here is your chance! I am offering the winner of this month's challenge a gourmet traveler gift bag full of fabulous fare I take with me on my debate trips! Description of specifics will be posted mid-month but know that it will be well worth your time. 3. Post the link to your blog in the comments section of THIS post in order to be counted for the contest by May 31st at midnight. These are fun ingredients! Perhaps I can think of something interesting to make. What a neat concept! I'm your basic meat & potatoes kind of cook myself. nice ingredients for this month! much easier to work with, I think. 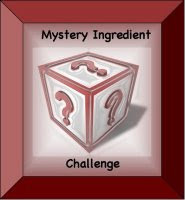 Dang it, I missed this Mystery Box challenge! I would have totally made chili with those items (yes, chocolate in chili is good). Maybe someone will do that!